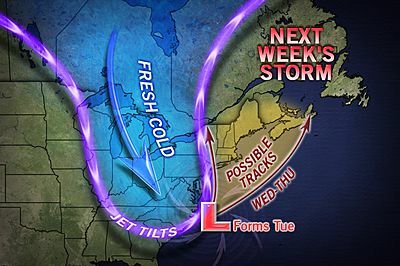 Accuweather.com says there is the potential for a snow event Tuesday into Thursday next week, just in time for election day as the east recovers from Hurricane Sandy. It won’t be anything like Hurricane Sandy, but colder temperatures and snowfall could come to the mid atlantic and northeast. Breezy and colder than normal conditions will occur through the weekend. Stay updated with NEXTGEN FM for the very latest.